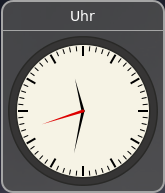 The folder 'analog-clock@cobinja.de' contains a folder called 'themes'. You can put your own themes in there. Hint: Use the default theme as an example. Adjust the file metadata.json in your theme accordingly, pivot-x is usually half of the width on your clock pointers and pivot-y is the length from the center of the clock. Nice clock and the time zones actually works. Would have been better and usable to get the clock to change colour or indicate night/day, AM/PM.